Beloved recipes & stories of an annual tradition. 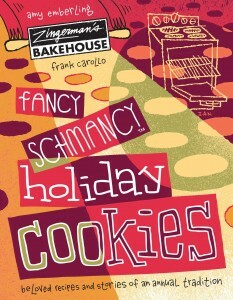 Since BAKE!, the hands-on teaching bakery at Zingerman’s Bakehouse, began teaching classes in 2008, the Fancy Schmancy Holiday Cookie class has always been the most popular class. Thousands of folks have traveled from around Ann Arbor and across the country to bake these cookies with us, many returning year after year and bringing a host of their friends and family. Now for the first time, this cook book shares the stories—and 17 of the most loved recipes—of the class. Learn to make Zingerman’s Bakehouse favorites like Classic Rugelach, Mandelbread, Ginger Jump-Ups, and Chocolate Macaroons. Get a taste of this treasured Zingerman’s tradition, straight from your own kitchen. You can find the recipe booklet at Zingerman’s Bakehouse, Zingerman’s Delicatessen, Zingerman’s Roadhouse, Zingerman’s Coffee Company, or ZingTrain. Need it shipped? 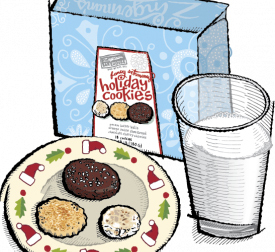 Zingerman’s Mail Order can ship one straight to your door!